Sometimes characters in my books make things my husband and I cook all the time – like Lila’s favorite flourless chocolate cake and her chimichurri sauce from INTO THE FIRE. However, once in a while I dream up something that sounds good to me at the moment, something sumptuous and seasonal, a little dish that will really hit the spot…and then I’m stuck when it comes time to share it with readers. 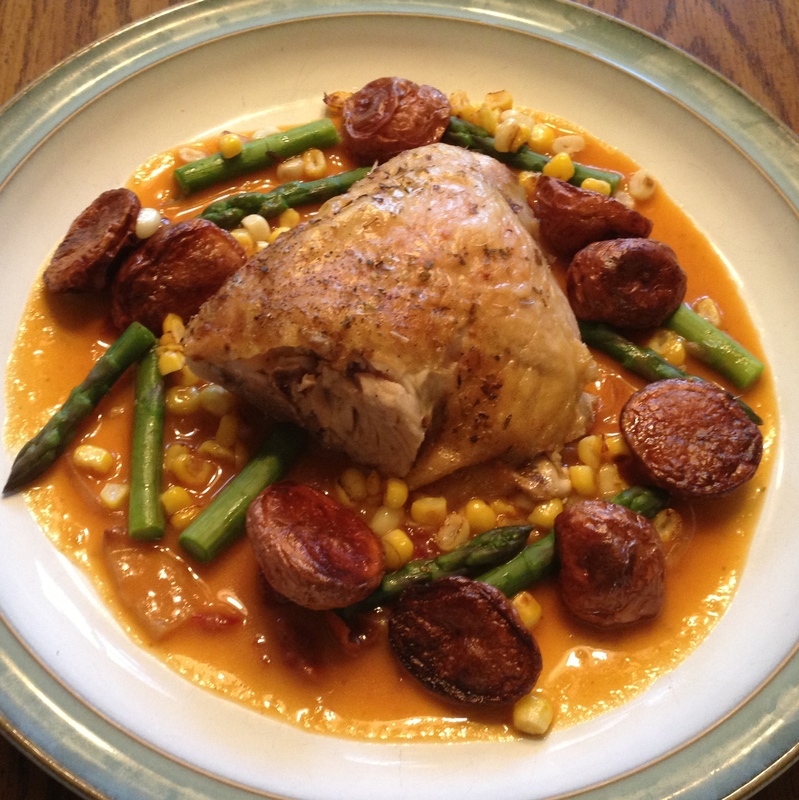 Chicken Alighieri is one of those recipes. I was hungry for comfort food when I was writing. I closed my eyes and fantasized about a roasted chicken with crispy, herb-y, salty skin… Mmm. Lila is pretending she can improve Jack’s already perfect dish, so she takes his sauce and adds a little pumpkin and chiles in adobo sauce. She adds roasted corn to the plate and husks for garnish. Why did she do this? Because I love spicy and rich sauces, and I had a craving for corn on the cob! I still do, in fact, so I really wanted to bring this dish to life. “Lila returned with a stalk of corn, which she soaked with water then tossed on the grill. Then she disappeared into the storeroom for a minute and returned with a can of pumpkin. As soon as she got back to the sauté station, she reached underneath and grabbed chilies in adobo sauce. Silently, she went to work on the dish. You’re on your own for the grilled or roasted chicken or pork and the veggies, but here’s a great sauce to serve with them! Put oil in a medium saucepot and heat over medium-high heat until oil just begins to smoke. Add onion and let it sit, undisturbed, until it begins to get brown around the edges. Stir. Turn heat down to medium-low. Continue to stir every few minutes until onion begins to caramelize. They will get limp and brown, sweet and delicious. If it starts to stick or get too brown, here’s the chef cheat: add a little bit of water and stir until it calms down and begins to behave. When your onion is well-caramelized, add the flour and stir until combined. Then slowly begin to add the stock. It will thicken and bubble. If it doesn’t, turn your heat up. You want to bring it to a simmer. Whisk it if you need to. Serve under or over just about anything that tastes good with a hint of sweetness and spice.